Such a great combination. 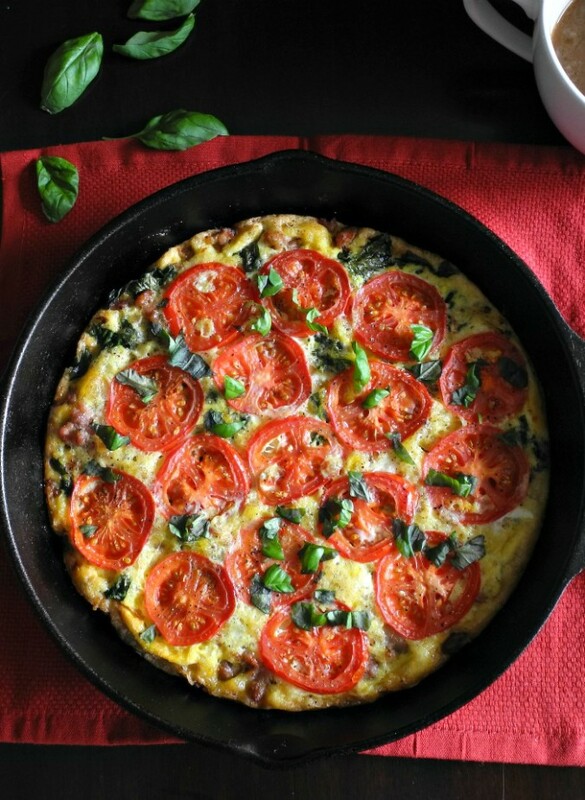 Sausage, spinach, basil & tomatoes make this frittata one of my favorite recipes. Preheat your oven to 375 degrees. Heat the coconut oil over med-hi heat in a medium sized cast iron or other ovenproof skillet. Crumble the sausage in the pan and cook, breaking it up as it cooks so it browns evenly. Add the crushed red pepper now if you wish for extra spice. Once your sausage is toasty brown, add the spinach to the pan and give it a stir to soften and blend with the sausage, then remove from heat. Sprinkle the sausage mixture with chopped fresh basil once off the heat. In a large bowl, whisk your eggs well with onion powder and salt, then pour egg mixture over sausage mixture slowly to cover. Top the egg/sausage mixture with sliced tomatoes and sprinkle with more sea salt and black pepper, to taste. Bake in the preheated oven 20-25 minutes, or until the eggs are set and edges begin to turn golden brown. Garnish with more fresh chopped basil once the frittata has baked. Let it sit to cool and set a bit, and then either serve or wrap and refrigerate/freeze for later use.